Hey, what's a better way to celebrate the New Year than with NEW! 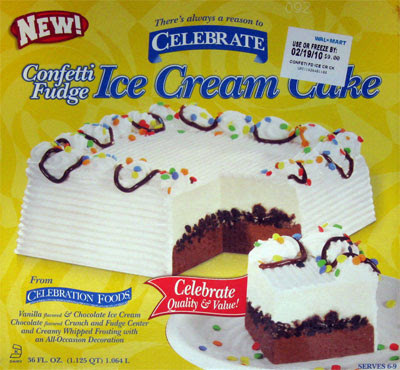 Confetti Fudge Ice Cream Cake from Celebration Foods. $9 sounds like a decent deal for 36 ounces of potential ice cream cake goodness, so let's dig in! It's New Years Eve so let's keep this simple. What you see before you is Vanilla flavored & Chocolate Ice Cream - Chocolate flavored Crunch and Fudge Center and Creamy Whipped Frosting with an All-Occasion Decoration. Sounds like the usual stuff, though I'm happy to not see that blue Carvel frosting that stains whatever it touches. Our squarish little friend is out and about. Again, nothing out of the ordinary here. We dug in and it's all pretty standard flavoring. Nothing groundbreaking here. Standard (i.e. 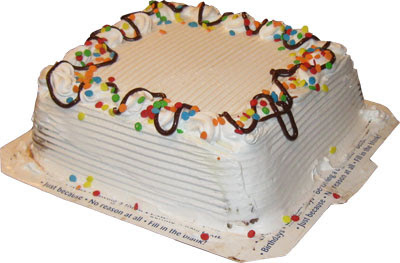 non-Cold Stone Creamery) ice cream cakes tend not to taste all that different and this is no exception, except for one "small" fact. This is a cross section of the cake and as you can see there seems to be some quality control issues. A Carvel cake has a very uniform layer of crunchy chocolate crumbs. The fudge layer here is an uneven mess. On the left, the fudge layer is pretty much non-existent. On the right, its a big solid mass that is just a pain to cut through. As you push down into it, it tilts up and rips the cake apart. I had to saw through the thing to get this picture for you. The fudge layer tastes ok, but there will be some technical difficulties as you hand out the slices. And yes, this cake may have been a fluke, but considering that I've never had a funked up Carvel cake, I'm going to hazard a guess that this is par for the Celebration course. Please note: While I did have my suspicions before, Celebration Foods has confirmed they are the people behind Carvel Cakes. So, one has to ask, why the quality control issues?